Chart Wealth... PHLX Utility Sector Powers Ahead! April 2007, Volume 4 Issue 2 Know It - Profit! In this issue, the broad market indices mount a comeback after investors banked profits in February and March. Also, the PHLX Utility Sector Index gets a spark... powering to new highs. Which power company is behind the surge? February profit taking caused a minor 6% pull-back in the markets as investors pocketed profits from a near 5-year up-trend. On a quarterly basis, the Russell 2000 (^RUT) is up a scant +1.69%... leading the other indices higher. The Wilshire 5000 (^DWC) and Standard & Poor's 500 (^GSPC) gained +1.14% and +0.30%, respectively, over the last three months. The Dow Jones Industrials (^DJI) and Nasdaq Composite (^IXIC) are seeing red... both down -0.69% and -0.06%, each, for the quarter. Natural resources, steel and power producers are big leaders in this issue. The PHLX SIG Steel Producer Index (^STQ) is up +32% for the quarter... trading to all-time highs. The PHLX Oil Service Sector Index (^OSX) gained +9.5%. Look for bigger returns as the summer travel season approaches. The PHLX SIG Coal Producers Index (^SCP) advanced +11% for the quarter. Also, the PHLX Utility Sector Index (^UTY) accrued +8% over the last three months. And, the PHLX SIG Oil Exploration and Production Index (^EPX) banked +6.35% for the quarter. Based in Columbus, Ohio, American Electric Power Co. Inc. (AEP) is a public utility holding company which generates and distributes approximately 35,000 megawatts of electric power, annually. Founded in 1906, AEP operates in 11 mid-western states. Over the last quarter, AEP was up over 14.5%... with analysts expecting revenues of $3.19 billion. The weekly chart shows AEP easing into the end of a third Elliott wave up. The Stochastic RSI may predict the end of the short-term trend as it moves into the extreme part of its range. As the volume tapers-off, the Elliott Oscillator continues to rise, confirming the strength of the over-all trend. 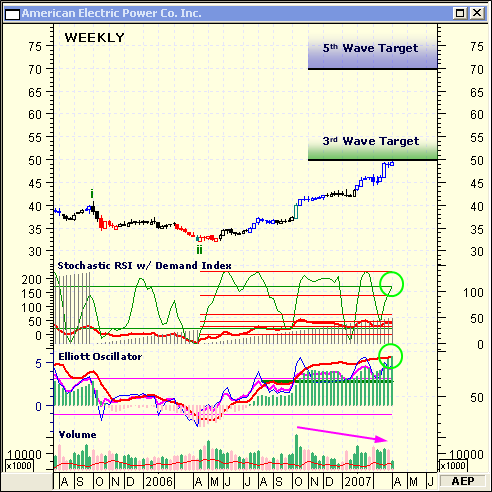 The daily chart of American Electric Power Co. Inc. (AEP) shows a well established up-trend. The expanding bands of the MA Oscillator confirm the strength of the trend... predicting it won't end anytime, soon. Additionally, the CCI reveals levels of price support, as well as, confirming the strength of the up-trend. Finally, the moving average channel has been a good indicator of price support... containing price action at key areas of congestion. 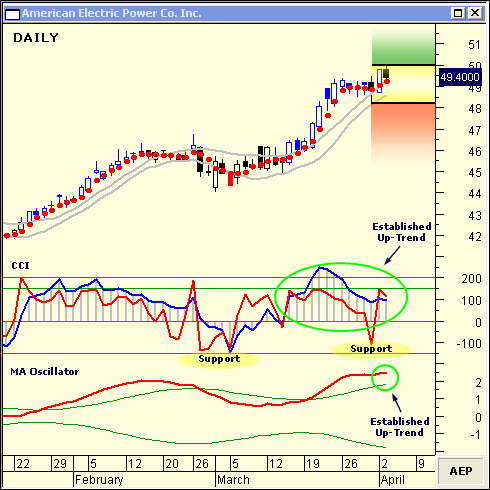 Look for AEP to trade above $50... trading to a final price target near $70. You may have noticed the Philadelphia Stock Exchange (PHLX) sector indices appear to outperform the others on a consistent basis. You have to ask yourself, are the PHLX component stocks an accurate reflection of sector activity? Or... are they merely hand-picked to enhance the performance of the index? These are some questions to consider the next time you are selecting a stock from the "strongest" sector. Up To 95% Accurate... Guaranteed!